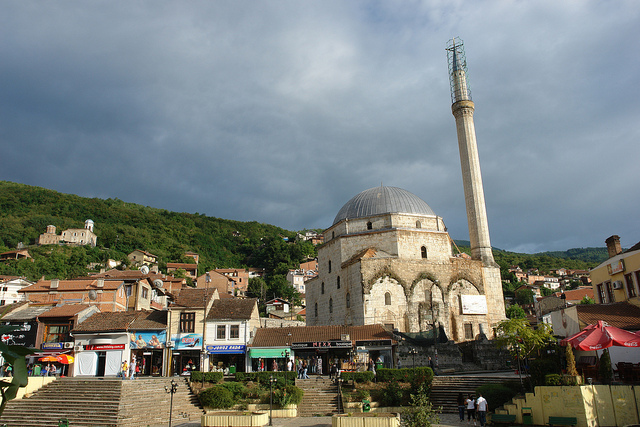 Islam is the majority religion in Kosovo, despite this element of identity having remained in the shadows for many years, eclipsed by politics. In the 40 days of Ramadan it re-emerges strengthened and now in Pristina new political forces are bringing it to the foreground. The only religious factor openly discussed in Kosovo during the last ten years, especially in relation to the state-building process, was the Serbian Orthodox Church. By involving the Orthodox shrines in the battle for Kosovo status, Belgrade has successfully presented Serbia’s main religion as a political factor in this territory. However, Albanian Muslims, who make up about 90% of the population and the leadership in Pristina, have failed to send a message that part of Kosovars’ identity is Islam. This hesitation probably happened because Kosovo’s strongest allies that helped the region to (re)write its newest history do not share the same religion and, furthermore, because important parts of the Western public opinion have an ill-concealed suspicion of the word “Islam”. Often the theme of religious radicalism monopolises the discourse about Islam in the region. Understanding the risks that any visible connection to radical elements of Islam might bring to Kosovo’s state building process, discussions on religion have been suppressed for years by the public opinion and the ruling and cultural elite circles in Pristina. The situation on the ground, however, looks different. A worldwide survey published this year puts Kosovo alongside countries that consider religion to be relevant for its people. The list is topped by Bangladesh, Niger, Indonesia and Malawi. According to Gallup, 90% of Kosovars claim religion plays an important part in their daily life. In Kosovo, the imams calling for prayer from the mosques can be widely heard, even though the response is not overwhelming, especially in major towns. One can easily have the impression that in the youngest state of Europe its predominantly Muslim population generally practices Islam in a much lighter way compared, for example, to Arab countries. The holy month of Ramadan, however, in Kosovo presents a unique atmosphere. In Pristina, mosques are overcrowded every night at the time of prayer. According to religious activists, this clearly shows that in the city there is insufficient prayer space to accommodate all believers. In Prizren, numerous bars in the historic town remove alcoholic drinks from their menu, in a sign of respect for the many that fast. In the western town of Peja, people queue in bakeries for fresh-baked bread before iftar (dinner), to dine with their families after a long day of fasting. Nightfall is very quiet in all of Kosovo during the month of Ramadan, different from the rest of the year. Identity specialists consider that eating iftar is more a social tradition of spending quality time with family, rather than a sign that all Kosovars fast and are “good” Muslims. Publicist Shkelzen Maliqi says that Islam in Kosovo mainly is practiced inside house walls. However, this does not mean that there is no social pressure to display religiosity. According to Maliqi, Kosovars may express their religious beliefs more openly today, especially when compared to the past repression under the Yugoslavian state. Oppression at that time included banning or deterring public meetings such as religious ones. The situation is now completely different: employers do not assign hard work to Kosovo Muslims fasting during Ramadan and even may shorten working hours. Religion and identity scholars believe that the Kosovars’ pragmatic stance resulted in the adoption of different religions in history. Compared to Christianity, Islam has been embraced much quicker because of the – practical economic – benefits offered to the community of “true believers” by the ruling Ottoman Empire. According to Agani, the religious identity of Kosovars through their three main beliefs, Islam, Orthodox and Roman Catholic, is a value that should be promoted as a means for international integration. As the leader of a small party that does not have any seat in the parliament, he still holds a deputy minister post in the current government. Agani’s mission is to develop relations with the Muslim world. Agani stresses, “We are working to get the best out of the personal bonds that Albanians have established during 600 years of Ottoman (Empire) rule in the Balkans. And until now, it is working.” He refers to official meetings the party representatives held in Kuwait, United Arab Emirates, and Bahrain. The Justice Party claims that their lobbying activities resulted in these states recognising Kosovo’s independence. The Justice Party advises the government to use personal relations to strengthen ties with 56 countries of the Organisation of the Islamic Conference (OIC). However, the political leadership has hesitated to follow Agani’s suggestion that Kosovo should apply for membership to the organization. Kosovo membership in OIC, though, is not even on the agenda of its diplomacy. Deputy foreign minister, Vlora Citaku, says Pristina hesitated to apply because most of the OIC members have failed to recognize Kosovo’s independence. Of the 56 member states in the OIC, only 16 countries have yet recognized Kosovo as a state, including Albania and Turkey. Citaku reveals the philosophy at the basis of Pristina's diplomacy, "Building constructive cooperation with all countries, including those with a Muslim majority, but not on religious grounds." The government, however, has not prevented leaders of the Muslim community to lobby for recognising Kosovo's independence. Institutions in Pristina are building a legal framework that complies with the European Union’s principles. Nevertheless, according to Citaku, the EU has no condition that integration processes should involve religious dimension. Citaku stresses, "Kosovo is part of Europe in its system of values, while the Islam applied here is a European Islam. Religion is not a core pillar of our identity and lifestyle." Media discourse defends the thesis that western lifestyle has been adopted in Kosovo society, and (re)introducing an eastern, Islam-based concept of society may create a social conflict. However, political leaders do not hesitate to keep the month of Ramadan high on their domestic public-relations agenda. Media coverage was dominated by dinners (iftars) hosted by politicians, which also showed their “generosity” to mainly fellow politicians during the holy month. Kosovars are still struggling to determine which role Islam should play in the general definition of their new national identity. Institutions in Pristina have clearly stated that the ultimate goal of the country is membership in the European Union, where member states share common rules, but simultaneously claim clear and deep-rooted cultural identities. In this perspective, a profound debate over the elements that constitute the Kosovar identity seems unavoidable. A devoted Muslim, Mr Agani already has a clear position on the matter. In his opinion, an Albanian from Kosovo should introduce himself in the following order: as a Kosovar, as an Albanian, and as a Muslim.